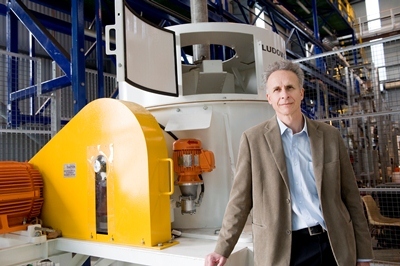 The award-winning technology, developed in collaboration with commercial partner Ludowici, and now with FLSmidth, is an industrial machine that separates fine particles on the basis of either density or size, improving the efficiency of the process with its unique tilted design. For Professor Galvin, who is Director of the University of Newcastle's Centre for Advanced Particle Processing and Transport, and the ARC Industrial Transformation Research Hub for Advanced Technologies for Australian Iron Ore, it confirms his reputation as an internationally acclaimed chemical engineer. The Reflux Classifier was developed by combing a conventional fluidized bed with a system of inclined channels to achieve enhanced rates of segregation of high density particles, and enhanced conveying of low density particles. "The technique relies on the fact that the value of a material is usually related directly to its density," Professor Galvin said. The Reflux Classifier can be applied to a relatively broad range of particle sizes, and achieve higher recovery of valuable material than other water-based technologies. The technology has succeeded in solving an existing processing problem by achieving the sharp separations essential in the recovery of premium, high grade metallurgical coal. Professor Galvin received the Australian Academy of Science’s Sir Ian Wark Medal and Lecture in 2012, the Australian Academy of Technological Science and Engineering’s Clunies Ross Award in 2014, and the Australasian Institute of Mining and Metallurgy’s Mineral Industry Technique Award in 2014 in recognition of the underpinning research and industrial impact of the Reflux Classifier. Under patent, over 100 Reflux Classifiers have been sold into more than ten countries with installed capacity estimated to be about 50 million tonnes per annum. Professor Galvin's research team, which forms part of the University's Newcastle Institute for Energy and Resources (NIER), continues to investigate the full potential of the concept in other areas. "The technology has potential significance for any industry where a separation process based on particle size or density is applicable," Professor Galvin said. "The chromate industry has recently installed a Reflux Classifier which is an important milestone for the commercialisation of the technology in the area of dense minerals." Dr Alan Broadfoot, Director of the Newcastle Institute for Energy and Resources (NIER), anticipates further success from Professor Galvin and his team. “The development of the Reflux Classifier has created a pathway to impact for several new technologies at various stages of development which will soon be ready for commercialisation”, Dr Broadfoot said. “Its not just about the science, but also the collaboration with the industry”. The opening of NIER in mid-2011 further enhanced the strong collaboration between the University's engineering experts and industry. The most comprehensive energy research institute of its kind in Australia, NIER confirms the Hunter region's reputation as a national hub for energy and resources research. The facility comprises extensive laboratories and industrial-scale pilot plant workshops unmatched by any Australian university.